Our increased awareness of how the environment has been affected by our use of hazardous materials has been good for both the environment and ourselves. As part of that, we have become aware that we use hazardous materials and pollutants as a part of our everyday lives. Pollution Liability Insurance is designed to address damage claims and suits involving pollution alleged to have been caused by a business or individual. In addition to liability protection, this coverage can also insure business property and operations from losses caused by a pollution incident. Read on to learn more about what Pollution Liability Insurance is all about. Pollution Liability Insurance coverages are designed to handle related losses to the business carrying the insurance policy (1st Party) and/or losses caused by the business to others (3rd Party). First party property losses are addressed by Premises Pollution Liability policies which are designed to protect insureds from pollution losses related to property that they own, rent or occupy. Environmental Liability Insurance is coverage for legal fees and judgments arising from third party claims of damage caused by pollution from the business. Two types of policies cover third party liability pollution losses. Contractors Pollution Liability coverage provides both indemnity protection and defense of claims in which a pollution incident is alleged to be the fault of an entity engaged in building, developing and general contracting. Pollution coverage added to Errors and Omissions insurance for Architects and Engineers can protect them from allegations of a pollution related loss caused by their work. Pollution liability insurance for truckers is also important when taking into account the hazardous materials many truckers haul throughout the country. Do I Need Pollution Liability Insurance? Property owners and tenants whose buildings and land have a history of having pollutants on the property or premises. An example of a risk that would need Environmental Liability Insurance is a building on land that had an underground storage tank that leaked fuel oil before it was removed, contaminating the soil. Contractors such as roofers who handle pollutants like tar as a part of their operations need Contractors Pollution Liability Insurance to manage the risk of their causing damage resulting from a pollution incident. Architects and Engineers who are involved in projects which have issues related to pollutants need to add Pollution Liability to their Errors and Omissions Insurance to manage the risk of making a mistake regarding the presence or absence of pollution issues as they plan and execute a project. What Does Pollution Liability Insurance Cover? 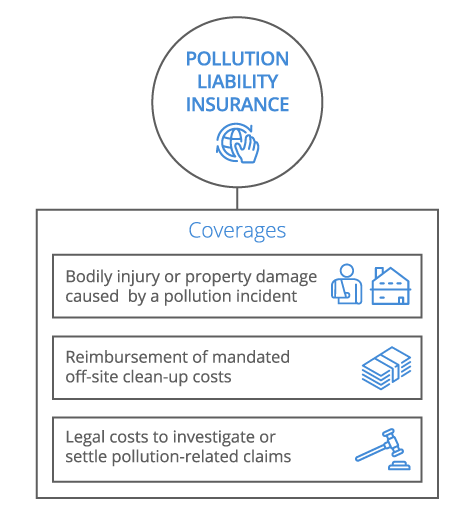 Pollution Liability Insurance provides the coverages needed by insureds with respect to pollution risks that are excluded in standard Property and Liability Insurance policies. Contractors Pollution Liability Contractors Pollution Liability covers the bodily injury, property damage and remediation costs for which a contractor who causes a pollution condition is liable (example: tar used by a roofer spills onto surfaces other than the roof and damages property in the process.) These policies can be issued to the contractor or can be part of an Owner Controlled Insurance Program or Contractor Controlled Insurance Program for a specific project. Claims defense for allegations made by others of a pollution injury caused by the business. Even if there is no truth to the allegations made, the insurer is obligated to hire and pay for the legal representation required by the insured to defend against the accusations. What Should I Know About Pollution Liability Insurance Coverage? Although the losses can be covered on an occurrence basis, that is the policy that is in effect when the loss occurs covers the loss; policies are generally issued on a claims made basis. This means that the policy that was in effect at the time the loss was discovered and reported during the policy period covers the loss. These policies also contain a 60 day extended reporting period, and a longer one can be purchased for an additional premium. In addition, as part of the insurer's defense obligation, the policy affords coverage for reasonable expenses to defend the insured in the event allegations of a loss are presented to the insured. Unlike General Liability policies, these costs reduce the limits of insurance available to pay for losses. For example, a claim is made against a policy with a Two Million Dollar Limit involving a lawsuit alleging a pollution incident was the fault of the insured. The case was tried to a defense verdict, and the legal expenses paid by the insurer were Five Hundred Thousand Dollars. The amount left to pay claims and defense expenses under the policy would be $1,500,000. What Does Pollution Liability Insurance Not Cover? Asbestos (in some circumstances the policy can be endorsed to provide coverage. Failure to Maintain Insurance (Example: The contract specifies a minimum limit of insurance the contractor must maintain, but the contractor fails to procure sufficient limits. What Are the Limits of Pollution Liability Insurance? These policies also contain a self insured retention. This means that before the policy affords coverage, the insured is responsible for a set amount of defense and indemnity costs. For example, unfounded allegations that a contractor was responsible for a pollution event that resulted in contamination resulted in $25,000 in defense costs being incurred The policy has a self insured retention of $10,000. The insured will pay the first $10,000 of defense costs and the insurance company will pay the remaining $15,000. How Much Does Pollution Liability Insurance Cost? How any existing pollution issues have been addressed. The environment of the location being insured. The pollutants that are on the property or being used by the insured. The types of work the business performs. In both cases, the prior history of insurance coverage and the claims history will also be used as factors to determine the premium charged. Finally, in the case of Contractors along with Errors and Omissions policies, the premium itself is an estimate based on the information provided at the time of application. The actual premium is determined at the end of the policy term when the figures used to determine the premium are known and submitted to the insurer.